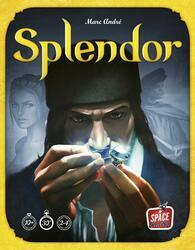 In Splendor, you play as a rich Renaissance merchant. You will use your resources to acquire mines, means of transport and craftsmen who will allow you to transform rough stones into magnificent jewellery. Shuffle each deck of development cards separately and place them in a column in the center of the table, in ascending order from bottom to top. Then reveal 4 cards from each level. Mix the noble tiles and reveal as many as there are players, plus one (example: 5 tiles for a 4-player game). The other tiles are discarded from the game, they will not be used during the game. Finally, place the chips in 6 separate piles (by color) within reach of the players.